It's that wonderfully chilly time of year when you gather with friends, sip eggnog, make lists and check them twice, then slay the ravenous unholy monsters that threaten humanity. 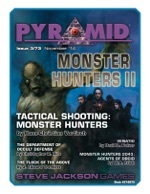 The current issue of Pyramid is dedicated to taking the fight against the forces of evil, with Pyramid #3/73: Monster Hunters II. This fearless issue features Hans-Christian Vortisch's expansion of GURPS Tactical Shooting with three new shootist styles (and armament suggestions) specifically designed for monster hunters. It also includes a GURPS Monster Hunters campaign framework -- with a new perk, power, Ritual Path spells, and Enemies for GURPS -- that sets the heroes as part of a secret government agency designed to protect the world. The installment also reaches out in new domains, with a cyberpunk organization and guide to taking the fight to the not-to-distant future (complete with GURPS details on typical agents). It also highlights the dangers of venturing too close to the other side with a group of darker hunters, with GURPS stats. And there's more in this issue that we're too scared to mention. The nights may be longer, but you're ready for action. Get this game-changing grimoire individually, or subscribe to Pyramid today and get this issue along with more months of monstrously good fun!